Hong Kong — April 8, 2014 — The late Doug Engelbart now named among the elite ranks of notable individuals who have been inducted into the Internet Hall of Fame for their significant contributions to the advancement of the global Internet. Today the Internet Hall of Fame recognizes Engelbart posthumously for his seminal contributions to personal and collaborative computing, and participation in the early formation of the ARPAnet, precursor to the Internet. Doug Engelbart has been named a Pioneer of the Internet, a category which recognizes and celebrates individuals who were instrumental in the early design and development of the Internet. In the early 1960s, Dr. Engelbart founded the Augmentation Research Center lab at SRI in Menlo Park, Calif., where he and his team pioneered a system for “augmenting human intellect,” envisioning workers sitting at display workstations could collaborate on solutions to humanity’s problems through a vast online information space. He was the primary force behind the NLS system, which featured document sharing, hyperlinking, teleconferencing, digital libraries, and more, with novel human-computer interface elements such as precursors to the graphical user interface and the computer mouse. 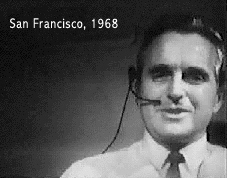 In 1968 he and his team staged the first public demonstration of their work, now famously known as the “Mother of All Demos.” Engelbart’s lab made Internet history in 1969 as the second host on the ARPAnet, sending and receiving the first transmissions on a distributed network, and by conceiving the first Network Information Center (NIC) to support the emerging ARPAnet community online. In his 1970 paper on the implications of networking, Engelbart foretold the emergence of a new “marketplace” representing “fantastic wealth in commodities of knowledge, service, information, processing, and storage,” with “a vitality and dynamism much greater than today’s, as today’s is different from the village market.” In his 1995 publication “Boosting Our Collective IQ,” he outlined what he saw to be the baseline requirements for information technology to reach its potential, outlining his template for a ubiquitous open hyperdocument system (OHS). 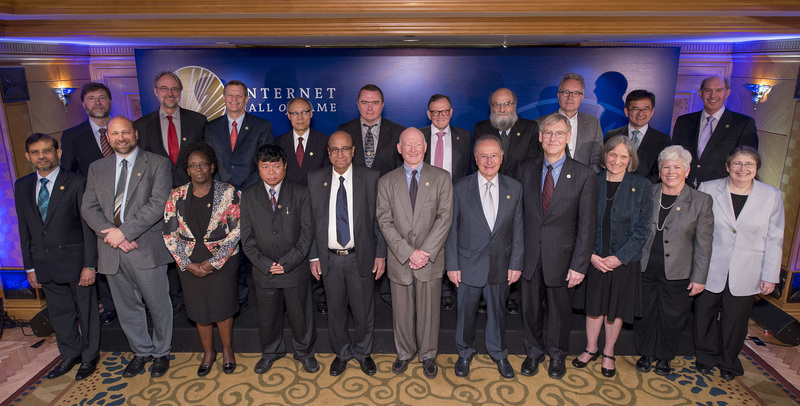 Engelbart was honored at the Internet Society’s 2014 Induction Ceremony on April 8 in Hong Kong. Watch the Internet Hall of Fame induction ceremony online. More details on the 2014 Internet Hall of Fame inductees, including their biographies and photos, can be found at http://www.internethalloffame.org. You can follow the Internet Hall of Fame on Facebook and on Twitter at @Internet_HOF (#ihof2014). Dr. Douglas C. Engelbart (www.dougengelbart.org) earned an unparalleled track record in predicting, designing, and implementing the future of interactive, collaborative and organizational computing. From his early vision of turning organizations into highly evolved “augmented knowledge workshops,” he went on to pioneer what is now known as interactive computing, collaborative hypermedia, knowledge management, community networking, and organizational transformation, with integrated prototypes in full operational use under the NLS system as early as 1968. After 20 years directing the Augmentation Research Center (ARC) at SRI International, and a decade in industry first at Tymshare, and then at McDonnell Douglas Corporation, Engelbart founded what is now the Doug Engelbart Institute with his daughter Christina Engelbart, working closely with industry and government stakeholders on collaborative implementations of his strategic vision. For outstanding lifetime achievement and ingenuity, Engelbart received the National Medal of Technology and Innovation, the ACM Turing Award, and the IEEE John Von Neumann Medal. His life’s work, with his “big-picture” vision and persistent pioneering breakthroughs, has made a significant impact on the past, present, and future of personal, interpersonal, and organizational computing.